monsoon distribution in the country is significantly influenced by irrigated agriculture. Scientists are now trying to figure out how vegetation and atmosphere interact and how it affects the spatial distribution of rainfall. A paper published in the July 21 issue of Geophysical Research Letters (Vol 33, No 14) said that two-thirds of the annual increase in evaporation and transpiration was attributed to irrigation. When the increase covers a large area, it can influence monsoon and global circulations. "Agricultural intensification has resulted in increased surface moisture leading to changes in regional precipitation. Identifying such processes is important for our numerical weather forecast models as users need a regional estimate of rainfall and monsoon variability in addition to national average," said Dev Niyogi of Purdue University who participated in the study. Debasis Lohar, a Jadavpur University-based scientist, who had carried out a West Bengal-based study in 2003, said "Drastic change in land use pattern in Gangetic West Bengal has taken place in recent period, which might affect the climate, resulting in severe water crisis over the semi-arid parts of the region." Comparison of mean annual evaporation and transpiration (vapour flux) from pre-agricultural and contemporary land cover revealed an increase of 17 per cent in vapour flux, with a 7 per cent increase in the wet season and 55 per cent increase in the dry season. "Interaction between biosphere and atmosphere has a significant influence on the spatial distribution of rainfall. We are now working on factoring that into the study of monsoon and pre-monsoon rainfall in different parts of India," said Lohar. The latest study said that the highest percentage increase in evaporation and transpiration occurred in Haryana (137 per cent) and Punjab (128 per cent). Though small in area the states have the highest proportions of cropland and irrigated areas. It was also found that decrease in transpiration and evaporation (vapour flux) was observed in areas where tropical forests were converted for agricultural use. These included the southern and eastern ends of the country. During the kharif season, the largest flux increases occurred in the northwest and southeast parts of the country, while during rabi, a large portion of northern India was found to be subjected to high flux increases indicating the influence of intensive irrigation in those parts. Recent researchers have identified dramatic changes in local and regional hydrology and weather patterns due to agricultural conversion and expanded cropland irrigation. "The next step of the research is to find specific instances of how this feature impacts our rainfall patterns. Our studies suggest that the largest effect of irrigation on small-scale convection, storminess, and rainfall will be in the vicinity of agricultural area. 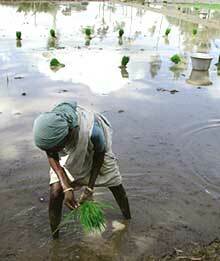 To understand such impacts more field experiments are needed," said U C Mohanty of iit Delhi.